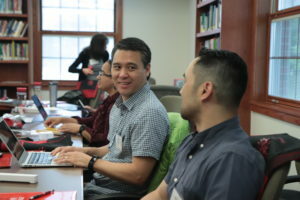 This colloquy gathers invited faculty of color from three major racial/ethnic groups in theological education—African American, Latinx, and Asian American—who are advanced scholars with demonstrated knowledge, experience, and commitment to furthering race critical work in their own personal and professional life. The invited faculty are also strategically positioned within institutional landscapes to offer wisdom and impactful leadership. While race has been an organizing principle in many of Wabash’s workshops on teaching and learning and there have been past colloquies dedicated to the interrogation of race and racism in the curricular and pedagogical agendas of higher theological education, this first-of-its-kind colloquy builds upon such good work to propel the investigation toward greater depth and complexity in light of new realities and new research within the broader ecology of theological education in North America. To foster, sustain, and advance deep conversations on the challenges and opportunities of critical race consciousness and anti-racist competencies for the reconstruction of theological education. To deepen the interrogation of structures and conditions which sustain hegemonic regimes of knowledge and normative assumptions about the nature and purposes of theological education. To develop new collaborative pedagogical, curricular, and institutional resources and strategies that are research-based, praxis-tested, multi-axis (intersectional), and can be widely shared to facilitate race critical work across the broader ecology of theological education. Participants will receive an honorarium of $3500 for full participation in all 3 colloquies, plus travel, and local expenses. In addition, participants are eligible to apply for a $5000 fellowship to “pilot” projects that emerge from conversations and ideas of the colloquy. These projects are conducted during the year of the colloquy. Participants will also be eligible to apply for a grant of $15,000 that follows up on the learning in their initial small grant of $5,000. The follow-up grant will build on the foundational work accomplished through the $5,000 grant on race critical work within the teaching and learning culture of their respective schools.